As someone in my late forties I often have people mistake me for someone younger than I am. At the request of one of my readers (thanks Jill!) I have complied a list of some of things I do to help myself age decently. 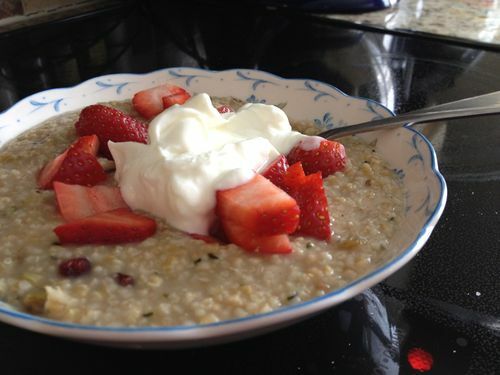 All winter I eat hot homemade cereal of steel cut oats, flax and hemp seeds with yogurt, fresh strawberries (or other fresh fruit), cinnamon, raisins and a bit of honey. It warms my insides in the morning and feels like armour against this everlasting winter. The steel cut oats take time to properly cook so I make it once a week and then store it in the fridge and just warm it up in the microwave daily as I need it. 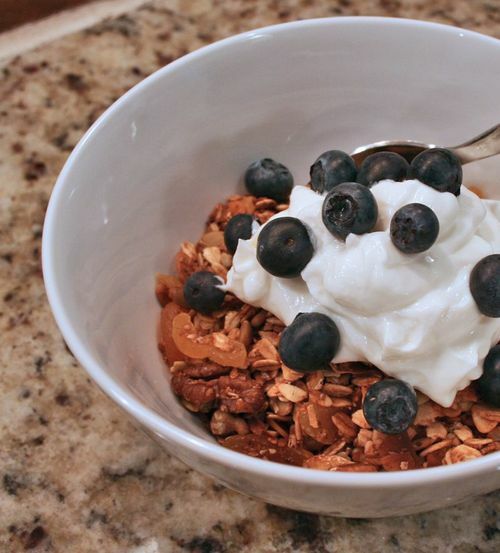 In the summer I eat my own version of homemade granola with fruit and yogurt. Yet so many of us still don't fit it in. Normally during summer, spring and fall I walk my dog every day. Believe me, she makes sure I do. During the cold winter weather I don't have that opportunity. That is why we both can't wait for Spring. I run, lift free weights and do floor exercises with lots of stretching a couple times per week. The more I workout, the more energy I have and the better I sleep. Every day before I get out of bed and every night before I go to bed I do 10-15 minutes of stretches and core exercises. This has helped my bad back tremendously. In the past my back would go out a couple times per year and I would be incapacitated as one of my lower discs had slipped. Now with the stretching I have managed to avoid that. As a creative person this one is one of my most loved daily activities but not always something I manage to fit in. I'm working towards changing that. Being creative is a stretch for the mind. I consider it play for adults. Using your imagination is fantastic for relieving stress. Everyone is creative in their own way. Just find what works for you. Cooking, writing, drawing, building, singing, dancing, painting, just thinking up ideas and creating lists of those ideas is a way to allow your mind to play and explore. You don't need to do it for a long time every day. Even 15 minutes of creative brainstorming daily will leave you with long lasting positive mental benefits. It can transport you to a different time and different place in the middle of your work day. It can motivate you, make you sad or feel like getting up and bustin' a move. Music touches our souls and lets our brains take a mini vacation. Try listening on your way to work or when you are having a coffee. I often listen to a "Best of the 1980's to Today" station while I'm working at my computer. Make some great playlists of different tempo mixes. They will be there for you to turn to like a good friend when you need them. I have relaxo, retro, dance, and running mixes on my ipod. and La Chanson des Vieux Cons by Vanessa Paradis. And yes…everything does sound sexier in French. Your body is 50-65% water. Getting enough of it daily will help you manage your weight, keep your hair and skin looking great and make sure you body eliminates toxins. 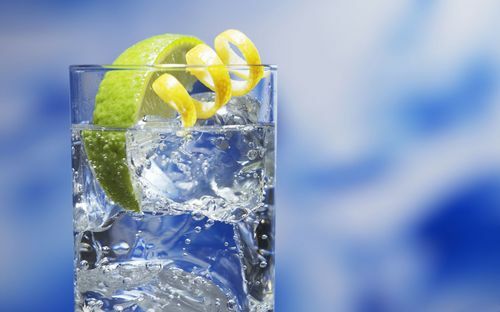 I drink 2 cups of hot water each morning and then the rest of the day I drink another 6-8 glasses of carbonated water. We bought a soda machine a few months back and I have become addicted to it. I can basically drink homemade Perrier all day long. Even when I'm out of the house I always take a bottle of water in the car with me. 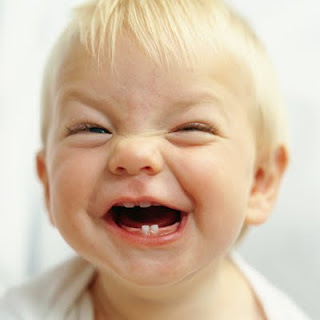 Laughing and smiling is brilliant for stress. Smiling makes us all look better and feel younger. One study suggests that people who smile more often live longer too, around 7 years longer than most. Find something that makes you laugh every day. With the internet now it's not hard to find good jokes, hilarious photos & blogs, or comedic podcasts online. Every day I am able to find one blog post that makes me smile or laugh out loud. The Daily Tay is one of the places I sometimes go for a laugh. 7. Get 7-8 hours of sleep every night. 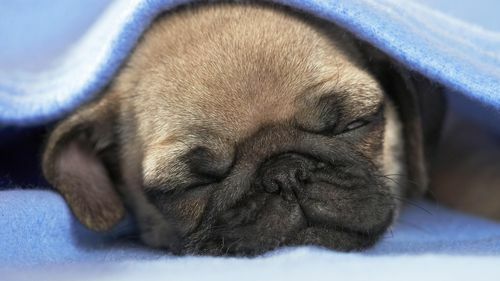 Winding down at the end of a day so you can get a restful night's sleep can be challenging. Often our brains don't want to shut off and we spend hours analyzing our day or mentally preparing for the following day. Having a bedtime ritual whether it be reading, stretching or meditation will help you relax before you climb into bed and prepare your mind to shut down for the day. I use my 15 minutes of stretching as my daily routine to let my body know I'm getting ready to go to sleep. 8. Use Sunscreen & Exfoliate. If I could take back all of my days basking in the sun and tanning beds I would. Nothing ages your skin more (other than smoking) than the sun. I always wear a hat in the sun and use a 30-60 SPF sunscreen on my face and body when I am outside. People often forget to put sunscreen on the back of their hands. I now have age spots on my hands because of that. This is such a simple thing that makes a big difference. I do it every 3-4 days while in the shower. I don't use anything, just my fingertips. I wait till the end of the shower to allow my skin to moisten and then just before I ready to get out of the shower I gently but firmly rub my skin in an up and down motion with my fingertips. All the dead skin just rolls right off. Some people use a bit of regular grain white sugar to do this but I find I don't need anything. Here is a more detailed description of how I exfoliate. I normally just exfoliate my face, neck and chest area. 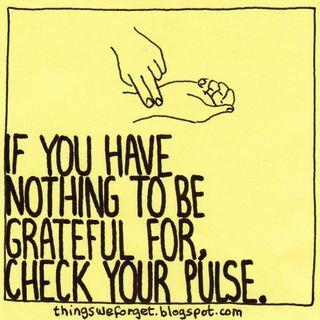 Practising daily awareness allows us to appreciate what we have right now. That you are still here. That is reason enough to be thankful. Being aware of that on a daily basis will help you keep a positive attitude and that will translate into a healthier younger you. Since my health scare last year I am more aware than ever of the daily tasks my body allows me to perform. I have kept those memories fresh in my mind to remind myself daily of all that I have to be grateful for. 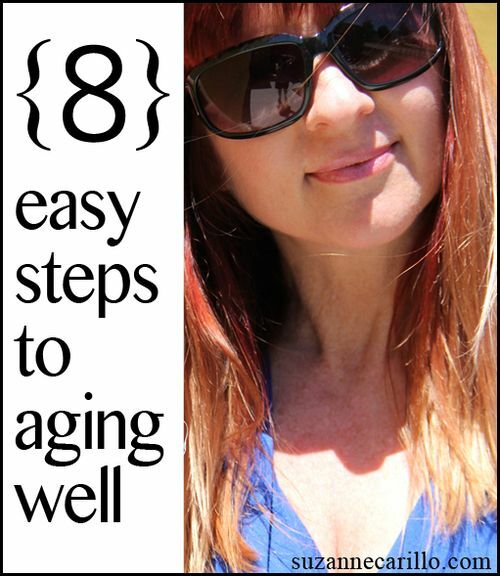 All of these tips are easy to incorporate into your daily routine and when practised regularly will help you age slower and live longer. Do you have any useful tips you practice yourself that you'd like to share? Great tips Suzanne! I stared drinking a cup of warm water every morning since my detox. I add the juice of 1 lemon, a tablespoon of honey & apple cider and teaspoon of cinnamon. I swear it has made my skin smoother! I struggle with getting good sleep and we are seriously in need of a new mattress. I don’t why we are delaying the purchase. Great reminders. I do most of these things but get off track every now and then. I plan on doing more exercize, more stretching, more laughing, and more winding down in the evening and spending less time at the computer! I’m very glad I got at early start on sunscreen use!! A great post and reminder to do all these things. Excellent advice. I follow all of them except no. 1. I try but I just can’t get into the habit of eating before noon. Really great tips, and things that are easy to incorporate to your life! Very good common sense stuff here – I try to fit in most of them, although I seem to have a problem remembering to drink water throughout the day. The being creative thing is very important, and that has fallen off my radar this winter in the midst of dealing with illness. Looking forward to getting that part of my life back. Great tips, Suzanne! I try to follow some of them, but I’ve always had a hard time with exercising and eating healthy. I’m a total sugar addict. Every time I try to eliminate it or simply minimize it in my diet I relapse after 4 or 5 days. I recently saw an article somewhere stating that sugar can be more addictive than cocaine. I guess that explains why I’m not able to control this unhealthy craving. Well Suzanne i do pretty well what you do, i guess they are the basics! This was such a cool post! And realized I already follow most of your advice, so it’s kind of reassuring to see that carrying on like that is the way to go! You CERTAINLY don’t look your age! 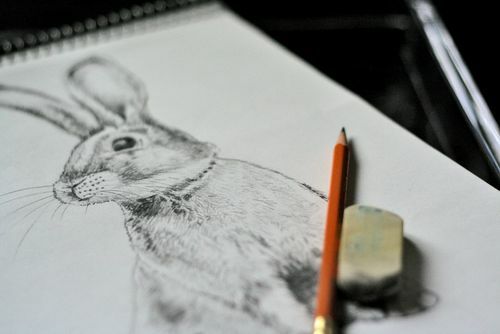 By the way, did you draw that beautiful bunny picture? And you are the living proof that these tips work, Suzanne – just look at you! The easiest one of all to follow is laughing, I do that one a lot! You do look youthful! These are great tips and I follow a similar routine. What a great list- I like that the focus is more internal than external. Those laugh lines look great when they come from laughing. 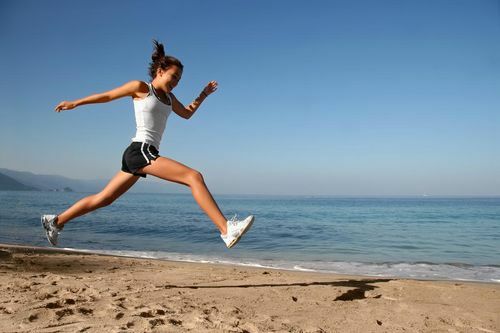 Youthful mind, means the body stays fit! Well, you look amazing, so all of those tips are worth their weight in gold. I do the water one. 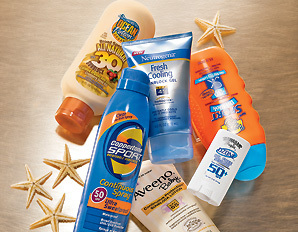 And the sunscreen one. The creativity. The laugh and the sleep (half of the time). But I really need to work on exercising and a good breakfast. I usually just have coffee. You are in your late forties?? You really look very younger! No, you have said it all and I hole heartedly agree with you. Although I don’t do everything, I do a lot on your list. Loved the laughing baby and the pug.